If the magical, musical and altogether lyrical play now enchanting the stage at Goodman Theatre were something from ancient Greece, it might be called “The Lamentations of Comala,” the Mexican village that provides the story’s setting, a ghost town that has literally been starved to death by its willful, angry patrón, Pedro Páramo. 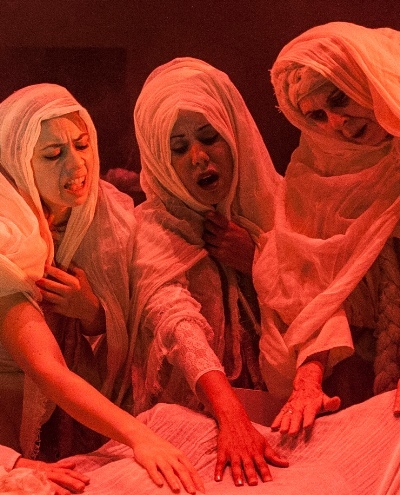 And even though Cuban playwright Raquel Carrío’s adaptation preserves the title of Juan Rulfo’s 1955 novel, “Pedro Páramo,” an aura of Greek tragedy pervades the story as a visual work. One man’s hubris brings grief and ruin to a once-vigorous community now translated into a populace of shrouded specters, pallid mirrors that reflect back on a beautiful time that was and the folly of a bitter soul. This Spanish-language staging of “Pedro Páramo” – the first of three productions that will make up the 2013 Latino Theatre Festival at the Goodman — is the fruit of a collaboration directed by two founding members of Teatro Buendía, Flora Lauten and Henry Godinez, with a large cast drawn from both the Cuban company, founded in 1986, and Latino actors familiar to the Chicago theater scene. The gossamer veils that wrap the ghosts of “Pedro Páramo” also bespeak the story’s complex layering, the human fragility of its characters, the mutability of their tales and relationships. But in those lyrical images one also sees, as it were, an echo of the many songs – the natural communion of a close-knit community — that both embroider and warm the narrative. Much of the beguiling score (with harp, guitar and keyboard) is the work of composer Zacbe Pichardo, but there’s also a lovely component of traditional songs like “La Paloma,” whose melancholy strain provides one of the show’s most touching episodes. 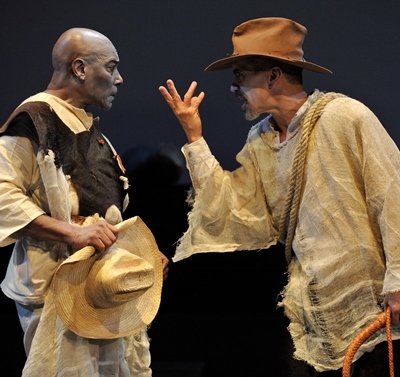 For all its evocative visual elements, and the English surtitles, “Pedro Páramo” is an elusive play. The narrative is non-linear and fantastical, the characters are dead except when they aren’t yet and relationships are sometimes ambiguous. That said, the outline is quite clear: This self-made man Pedro Páramo (Henry Godinez), who owns the town and the lives of the people in it, takes what he wants, notably land and women. 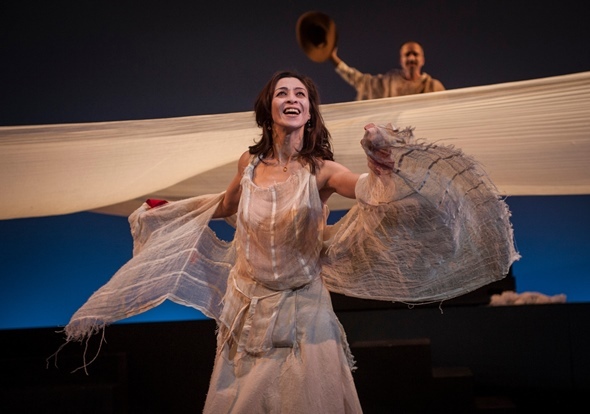 But there’s one woman for whom he can only pine, the idol of his youth – the beautiful Susana San Juan (Charín Alvarez), who was taken away to another town by her father when both she and Pedro were still young. Many years later, after her husband has died, Pedro induces Susana to return, only to see death take her. When the downtrodden people of Comala fail to make a worthy show of grief at Susana’s funeral, the furious Pedro shuts down the village, strangling its economy and starving everyone. This is the town of ghosts we see as the curtain rises. In flashback, we watch the whole melancholy chain of events reenacted — through the eyes of a young man called Juan Preciado (Sándor Menéndez), son of the hated Pedro Páramo, who has returned home to honor the last request of his deceased mother that he meet his father. More than just words and music buoy this luminous production. It fairly floats on the company’s balletic quality of movement, sometimes literally in the form of dance but at all times in the sensuous lines sustained by the actors, who indeed seem to inhabit insubstantial forms. And their gauzy winding sheets unfurl to become waterways, vistas, entanglements or the ties that bind. It is a consummate ensemble effort; to that point, it would be a vain task to distinguish between which actors – in principal roles, mind you – are from the Cuban company and which from Chicago. Here, they meld into an intoxicating perfection of spirits.